Has anyone ever tried to get off the train in Drumgelloch with a view to going to see Airdrie play? If not, heed this warning….give it a run through first! I managed to get lost en route to the ground and en route back from the ground – two different routes as well. Google Maps doesn’t work, fans forums for directions don’t work, and asking an old lady pushing an empty pram seemingly doesn’t work! The stress associated with finding the place was worth it though...but only just! “Name a football team that plays in one of Scotland’s four main divisions”. 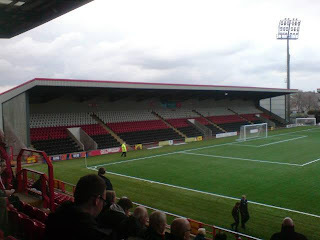 Of course, Airdrie (United) are a club that were re-invented in 2002 after the collapse of Airdrieonians and although they’ve inherited the now defunct club’s Excelsior Stadium, they haven’t seemingly taken on their fan base – I remember seeing Airdrie when a kid and being hugely impressed by the vast numbers in which the club was supported, both home and away. Anyway, arriving at the ground, I was still impressed by the surroundings. 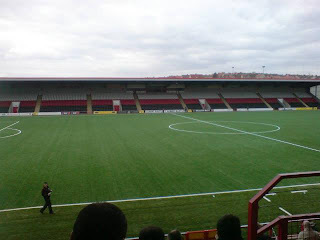 The Excelsior or "New Broomfield" as it is referred to by the fans (after Airdrieonians’ old Broomfield Stadium) is a stadium that was built for the SPL and belongs in the SPL. It does have the "purpose built" about it, but not in the horrendous way that the likes of St Mirren Park have been purpose built. After paying £15 to get in (fairly expensive for Division Two?) 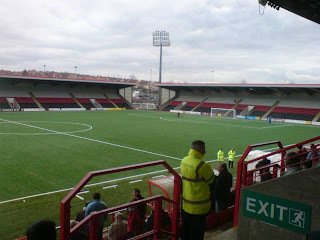 I sat in the Jack Dalziel end (named after a former Airdrieonians Chairman), opposite the East stand, and with two identical stands – the North and South - at each ends. With the exception of the Jack Dalziel, all were unused which is a shame as they look the part. The fans around me were interesting though. Next to me was a father and son duo who, for the 90 minutes, sat with their arms folded, grumpy faces and between them using only two words all game: “Mughrf” and “Psssht”. I’m not sure if these were signs or approval or disapproval as their stupid faces didn’t change the whole game. Clearly a different generation of lad these days. Disgrace. These bunch of twats appear to be what youth of Airdrie aspire to.. In terms of match action, all the good stuff came in the first 45 minutes. From the off, Forfar looked like a considerably better side and despite the result, I still think they’re a far superior team. However, for whatever reason…just didn't show up. 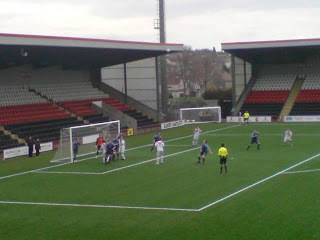 Sure, they played some nice stuff and their equalising goal to make it 1-1 was the best I’ve seen in all games to date with Paul McQuade turning nicely and curling into the opposite top corner off the post. However, that was pretty much it from the away side. 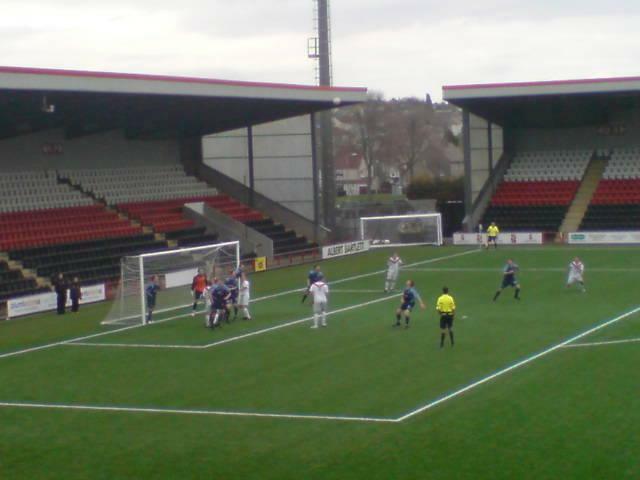 The home side, while not great, did pose a threat through the hugely impressive Gary Mackay-Steven. Midfield duo Ryan McCord and Graeme Owens also looked reasonably talented, as did Ryan Donnelly up top, but Airdrie really weren’t much to write home about. Their goals all came from set pieces: The first, a decent free kick from Owens from about 20 yards; the second, a penalty from McCord after the most blatant dive I’ve seen in my life; and the third coming after a corner from Johnston was met at the near post by Donnelly whose near post header finished the game off. One thing that is a shame is how an old, well supported Scottish team like Airdrie has become a less than well followed, Division Two at best, side. 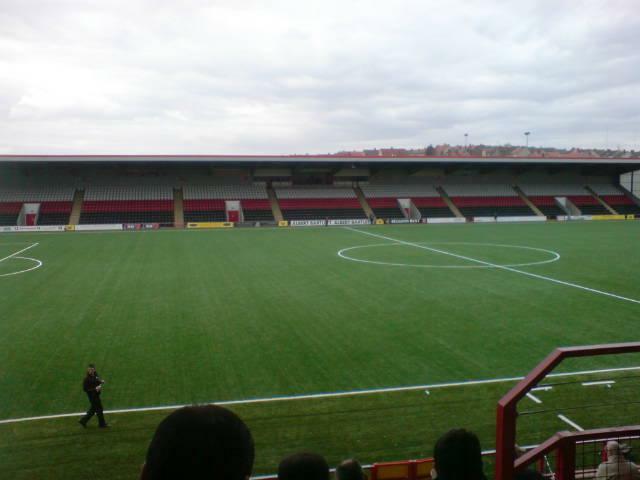 Without a miracle or some serious investment, you can’t see the Diamonds getting back into Division One anytime soon, let alone the SPL. Perhaps I just need to deal with this though – that one of the sides of my youth is now no longer a force. This could be due to the fact they’ve been re-invented I suppose, but I think there’s maybe more to it now. They seem to have a fan base much like that of Albion on Matchday 2, and with the exception of the Mullet Twins in front of me, all seemed to be a fair bit older than I’ve seen at some of the other grounds. Perhaps these old lads are, like me, still remembering the days of Airdrieonians and re-living it through Airdrie United while the younger football fans who would maybe have followed their local team in the past are now Old Firm converts instead…? 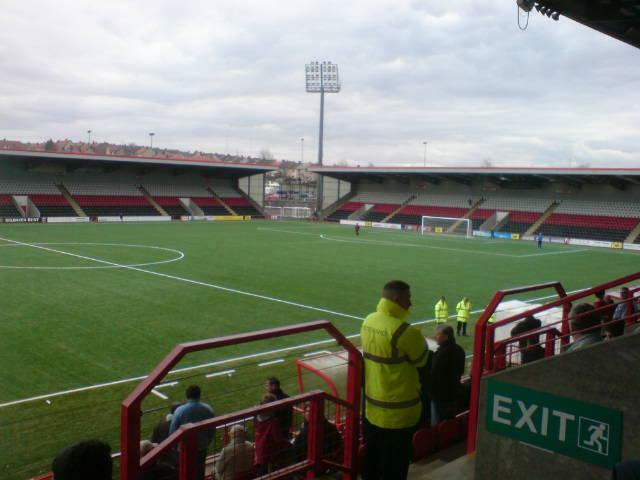 Star Man: Gary Mackay-Steven (Airdrie) – this lad is a huge talent. I’ve seen a lot of Division One this season, where there are many talented wingers. He would certainly not be out of place at any of the middle-to-top sides in that league. Catering: Also not bad, £3.00 for a tea and a pie – still to find somewhere to beat Cappielow and Day One - 7/10.